[singing the 'blahs' in tune with the song]. Yeah, I forgot the words. Christmas time is definitely here. How do I know? Well, because my bank account has been drained (by me, of course) and the crazies at Toys-R-Us are fighting over these little things called Zhu Zhu pets. I'm still not completely sure. I did find out that they were a popular choice among childrens 'want' lists this Christmas, though. My niece, included. Needless to say, I didn't partake in the battle to get any of these pets (sorry, Sara...I'll leave that FUN task to your parents). But, I did finish all of my Christmas shopping this weekend. YAY me!!! I seem to be on top of things this year. I guess there truly is a first time for everything. 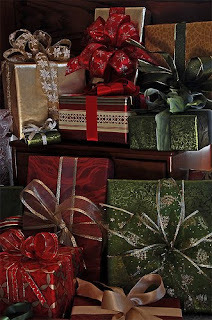 Now comes the FUN part...the wrapping and stacking all of those beautiful presents under the tree. Truthfully, if I'm lucky maybe one or two will turn out like that. Sadly, wrapping fun (for me) expires around the two-gift mark. My response, "Yeah, I know." LOL. Maybe I should get a job at the mall wrapping presents at Macy's. Then all of your gifts could look like mine, too! Aren't they so pretty! I'm not worried about the wrapping, though. It's what's inside the pretty paper that matters (or some people say it's the thought that counts...if you believe that nonsense). I am getting a little worried about something else, though. 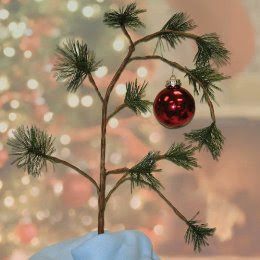 This weekend I saw my mom's Christmas tree. Yep, that's a picture of it, alright. 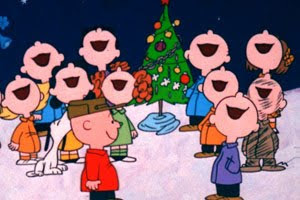 It's a Charlie Brown Christmas tree, to be exact. Creative, huh? The tree is cute and all, but all I can seem to think is, "what is my mom planning on getting us that's small enough to fit under that tree?" And the only rational explanation is, "she's is giving us all checks for a MILLON BUCKS!" That would be awesome. Plus, all those checks would stack nicely under that small tree. Thanks MOM! You're the BEST!!! Guess I'll have to wait and see. So for now, I'm off (planning what I want to spend my million on). But, if you haven't read this one...that's great! It will be like a brand spanking new post for you! YIPEE! I like re-runs especially if I missed it the first time!! Now, not only can you see re-runs on TV, but you can see them on my blog, too. What would those be called? Bloguns? LOL. 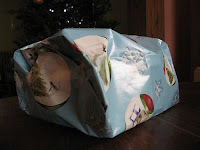 And I'm a terrible wrapper... my gifts look like I've run them through a steamroller before presenting them. That's why I usually stick with bags, haha! It's always nice to dream...huh?